Fun, dangerous, and now banned in the US! 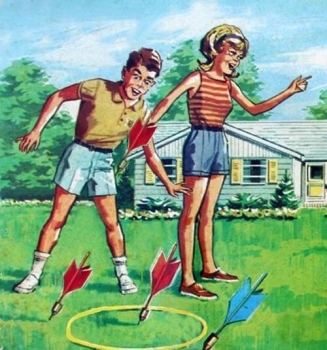 There were a few occassions (remember that we were just dumb kids at the time.) 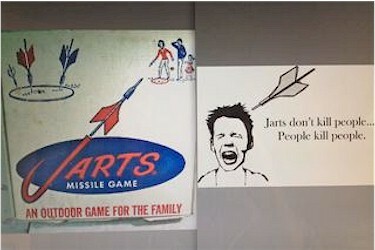 when we would put the "Target Ring" in the back yard and then go into the front yard and throw the Jarts over the house. Its truely amazing that nobody was killed or maimed. @Doot - LOL Darwinism in action. I guess I passed because I'm 64 and the only injury I got was stepping on the hard plastic fin with bare feet. Had these. Thought I might still but I'm not seeing the box. Same box art as this picture and everything. We used to shout "incoming". This seemed to keep casualties low. Well...relatively low.